This course is designed for staff and Volunteers to learn how to use PCLive to engage with Peace Corps' communities of practice. The course will take approximately 20-25 minutes to complete and contains knowledge checks and quizzes. Your progress is indicated at the top of each page. Please complete each page before moving on to the next one. You can navigate to any page of the course using the navigation pane on the left, which you can hide by clicking the left arrow tab at the top. Click Start course at the top of this page, then click Start when you are ready to begin. In the context of Peace Corps, a community of practice (CoP) is a group of staff and/or Volunteers who work on projects in one of Peace Corps' areas of impact, identified by sector, cross-sector programming priority (CSPP), or type of project. Members of a CoP learn how to do their work better through regular interactions with each other, including sharing resources, discussing best practices, and collaborating on projects. For example, Volunteers who teach English as a foreign language (TEFL) in Cambodia could share lesson plans and ideas for better classroom management with TEFL Volunteers in Costa Rica. Peace Corps staff who have expertise in TEFL, like Program Managers, are a part of this TEFL CoP and can contribute by providing resources that are proven to be useful and effective based on their experience. 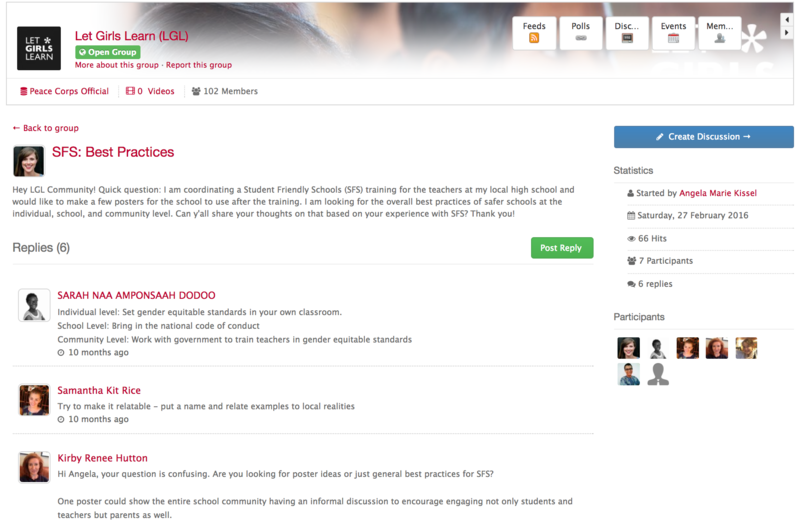 PCLive provides digital space for communities of practice to interact through online discussion forums called Groups. Volunteers can connect directly with subject matter experts, sector specialists, and other Volunteers around the world wherever they have an Internet connection to talk about their projects and provide expertise. Why should I participate in a group on PCLive? Peace Corps Volunteers and staff, including sector specialists, subject matter experts, and post staff, can benefit from using PCLive to engage with their communities of practice in many ways. Read about these benefits below, then answer a short reflection question. Learn new and best practices through discussions and success stories. Get answers to questions quickly and from several perspectives. Avoid reinventing the wheel and duplication of work. 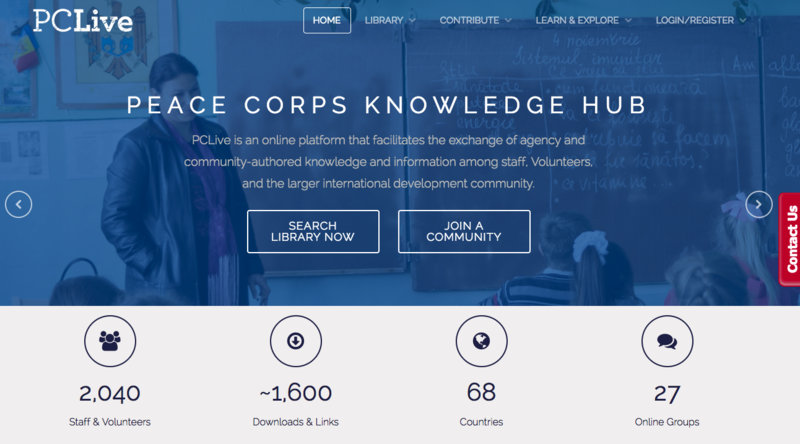 Get more relevant and targeted resources for Peace Corps projects that you can’t find by searching the Internet. Get resources and tools that have worked for others to help you do your work better. Get recognized when you post about your success stories and accomplishments. Share your work globally and expand your impact so that staff and Volunteers at other posts can improve the quality of their support to their host communities. Stay up to date on current developments and new approaches in the field. Peace Corps Official Groups are moderated by expert staff at PC/Washington to ensure quality content and engagement. Get involved at your own convenience wherever and whenever you have Internet access. 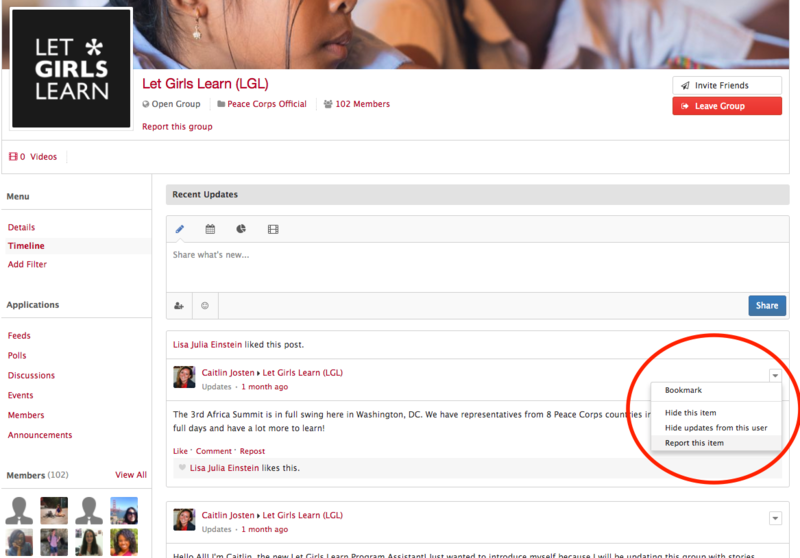 Posts and discussions are saved and can be linked to so that the same questions don’t have to be answered again and the same resources can be viewed and accessed any time. Augment and extend in-person learning events: Share and get resources immediately during workshops and conferences, then continue the conversation online when participants return to their office, post, or site. Get advice from experts more informally, with less need for individualized consultations via email, phone, or in-person. Single sign-on allows you to login using the same username and password you use for Facebook, Google, and LinkedIn. 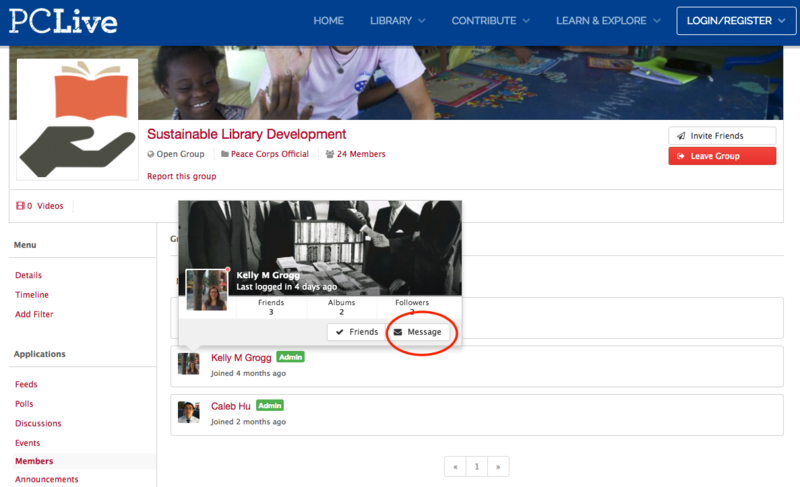 Staff do not need to login to the Peace Corps internal network. Build professional relationships through online interactions, learn who does what, and know who to ask for what. Reach a broader audience more quickly when disseminating information, resources, and guidance. Of the benefits mentioned above, choose 5 that matter most to you and rewrite them in the text field below. Once you click Submit, your answer cannot be changed and will be saved for you to refer back to later when you access this page. Can cover almost any topic related to Peace Corps projects conducted by Volunteers, subject to approval by the PCLive administration team. QUIZ: Which of these are unique characteristics of Peace Corps Official Groups? They can cover almost any topic related to Peace Corps projects conducted by Volunteers, subject to approval by the PCLive administration team. They can be moderated by any staff or Volunteers. They only cover Peace Corps' programming sectors and cross-sector programming priorities, training areas, and agency initiatives. They can be Open, Closed, or Invite Only. They are global communities, open to all staff and Volunteers. They are moderated by a staff member at PC/Washington. Click the checkbox next to each item that applies. Then click Submit. QUIZ: Which of these are unique characteristics of Community Small Groups? Watch the video below to see how to find and join groups on PCLive. You can expand the video to fullscreen view by click the box in the bottom right corner of the video. 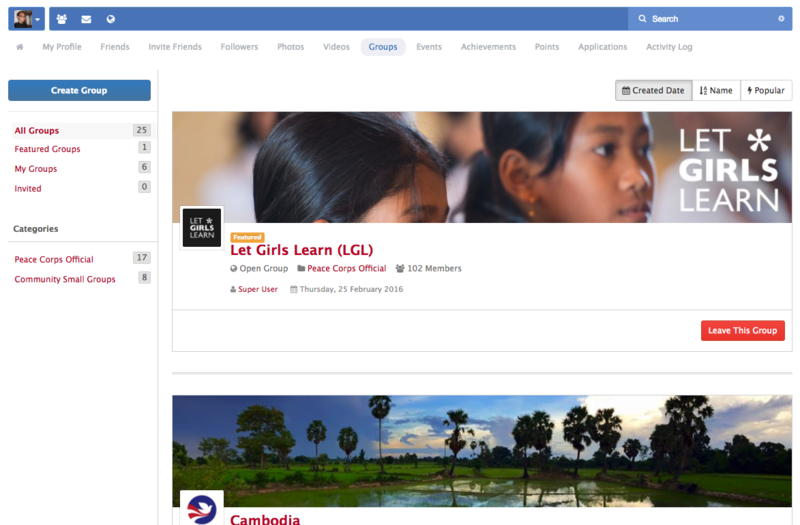 QUIZ: How do you find the list of Peace Corps Official groups? Click and drag the text boxes below to put them in the correct order of steps you would take. Click Submit when done. QUIZ: How do you find all the groups on PCLive? What groups will you join? Now that you know how to find and join groups, login to PCLive now and look through all the groups. Find groups that are relevant to your work or expertise. Write a list of at least one group that you will join. Use the text field below to write your response. Once you click Submit, your answer cannot be changed and will be saved for you to refer back to later when you access this page. Hover over each "i" to read about each feature. QUIZ: Where do you click to view and create new discussions? Click the place in the image below where you would find this option. Click Submit when done. QUIZ: How do you Hide or Report a post? QUIZ: Where do you find the Group Description? Click the place in the image below where you would find this information. Click Submit when done. How do I contribute and participate? Ask for information, feedback, advice, and ideas for your projects. If you are running into an issue in your work, chances are that your peers have experienced similar issues. Troubleshoot and learn together. Experts in the group can weigh in to give you critical advice to help you succeed. Get feedback before implementing a new idea or process to ensure you make informed decisions while planning. This is a great way to use the Discussions feature to start a discussion thread. Sharing success stories is a great way to inspire others to follow in your footsteps and will also help them learn some new and best practices from you. Don't be afraid to share stories of unsuccessful projects as well. Mistakes are crucial to learning. Sharing those stories will help others know what to look out for and how to avoid pitfalls in their own work. Help others learn from your experience by talking about what you have found to work best and how they can implement those practices. The most useful contributions to a community of practice are often tools that members can use immediately in their work like tip sheets, guides, manuals, how-two videos, visual aids, worksheets, and templates. Other great resources to share include insightful articles, videos, blogs, podcasts, and websites with additional resources. 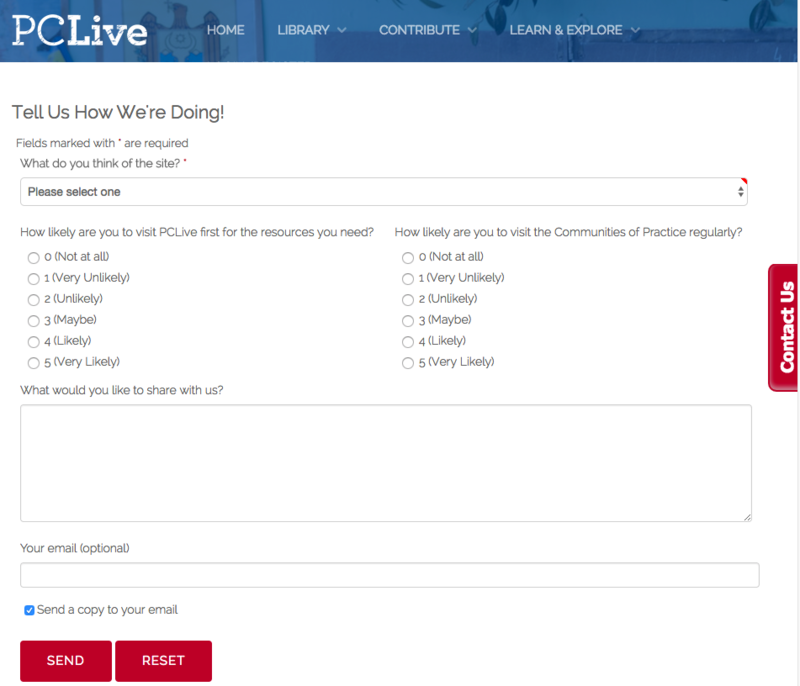 Submit these resources to the PCLive Resource Library to make them available to everyone, then post links to them in the group. A community of practice is only as strong as its individual members and their commitment to supporting each other. Introduce yourself and let people know about your experience and expertise so that the community knows that you are a resource for them and what you can help them with. 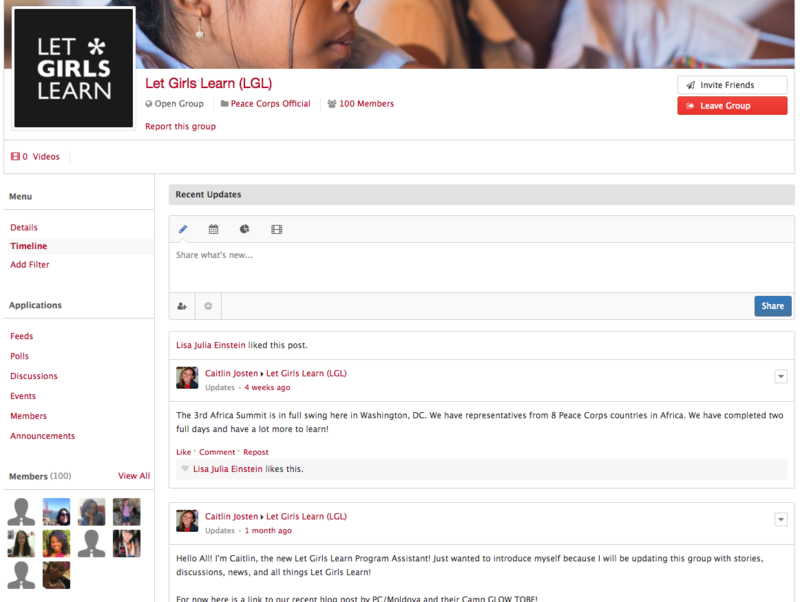 The image below is an example discussion thread from the Let Girls Learn (LGL) group. Look at the image then respond to the prompt below it. Based on the suggestions on the previous page and the example above, describe 3 ways in which Angela and LGL community members are contributing and participating in the group. Use the text field below to write your response. Once you click Submit, your answer cannot be changed and will be saved for you to refer back to later when you access this section. The PCLive community is large and diverse, comprised of current Volunteers and agency staff. Users are expected to treat each other and the PCLive staff with respect. Please remember that you are fully responsible for the content of your comments. Comments should be limited to those related to the specific blog post, discussion board topic, or resource item. This site is not the place to express opinions or beliefs not directly related to the particular blog post, discussion board topic, or resource item. To read the full policy, first login, hover over CONTRIBUTE, hover over Communities of Practice, then click Community Guidelines as shown below. If you feel that any content on PCLive is in violation of the Community Guidelines, there are three ways you can address it. If a post or group member is off topic, inappropriate, or offensive, you can notify a group moderator (also known as an Admin). Identify the group moderator(s) by clicking on Members while in the group then click on Admins. Hover over the profile picture of any Admin to bring up a pop up box. Click Message to bring up another pop up box in which you can write your message and click Send. Click the small down-triangle button at the top right of any post to see more options. Click Report this item. A pop up will appear where you can provide details and click Submit Report. The PCLive administrators will see your report and respond appropriately. Click the red "Contact Us" tab on the right side of the homepage to tell us about a problem. Give us as much detail as possible so we know where to find the issue and how to address it. The PCLive administrators will see your feedback and respond appropriately. Providing your email address will allow us to follow up with you. Congratulations! You are now ready to get the most out of joining a group on PCLive. Login to PCLive now, join the group(s) that you listed earlier, and start posting. You can begin by introducing yourself, then telling the community what you are working on or how you can support them.